This beautiful orchid can be quite common in boggy environments. A spiralling series of pink flowers, each with a showy white labellum, growing on a vertical stem. The flower spike does resemble a hair braid and it goes by the common name Austral Ladies Tresses. More accurately, Spiranthes australis. We visited a high country swamp last week, in South East Forests National Park. These orchids were among many flowers putting on a show. Several plants at the site are rare or have a restricted distribution. This may also be true for this orchid, as it has been reported that the region is home to a distinct Spiranthes species - Spiranthes alticola. I have no evidence either way and didn’t record details of the flower … I was too distracted by the antics of a visiting bee. 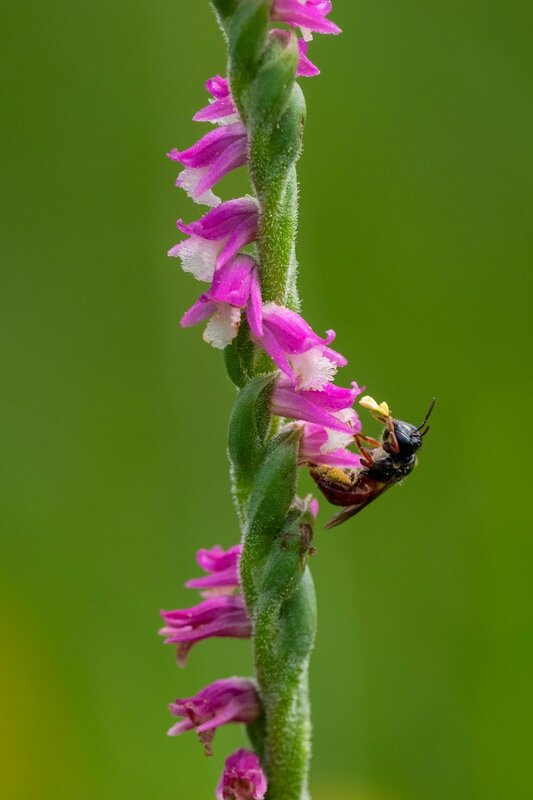 This medium-sized bee was feeding on flower after flower, working its way around the orchid spike. She would probe deep into each floral tube, before crawling to the next flower. And when she pulled her head out of a flower, the orchid’s specialised pollen parcels (‘pollinia’) where stuck on her mouthparts! Here is another series, again showing attached pollinia. The bee carried some pollen on her hind legs, but I realised that this wasn’t pollen from the orchid. In fact, she didn’t seem to know quite what to do with the orchid pollinia. She would rub at them with her front legs, and they seemed to fall off or be knocked off eventually. And the bee just carried on seeking nectar. Orchid pollination has long fascinated biologists. 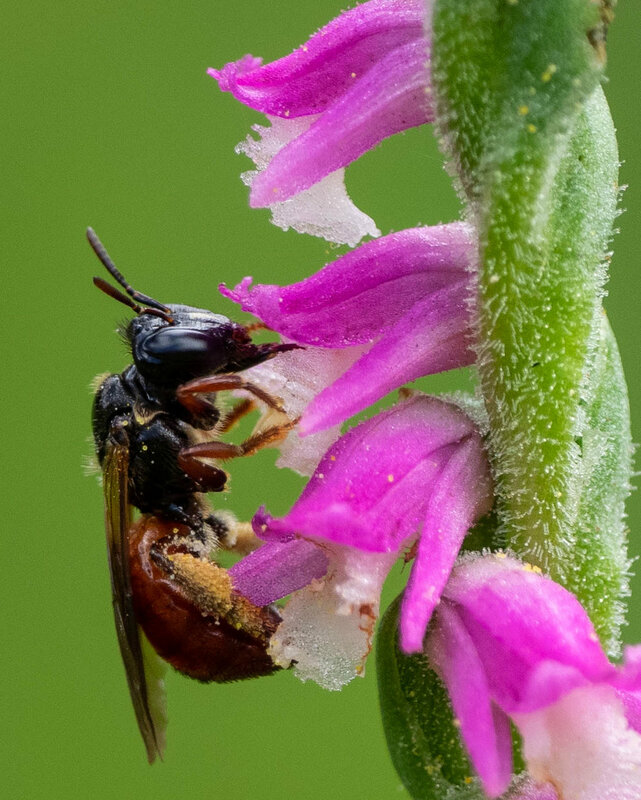 Unlike plants which release masses of pollen and rely on generalist pollinators, orchids package their pollen and often require specific insect visitors for effective pollen transfer. So did this orchid and this bee have such a relationship? A quick web search web uncovered a paper describing the pollination of Spiranthes australis in some detail (Rudie H. Kuiter, March 2018). The author had spent many hours flower-watching in southern Victoria, photographing visiting insects and recording their patterns of movement. In his paper, he also described the anatomy of the flower and how it changes as it matures. And Kuiter concluded that little bees such as Exoneura were unlikely to be effective pollinators. Rather, these orchids seem to rely on larger native bees like the Blue-Banded Bees (Amegilla sp.). Despite the careful observations recorded by Kuiter, there is no doubt more to be learned about this plant and its insect visitors. The same is true for many species of flowering plants. 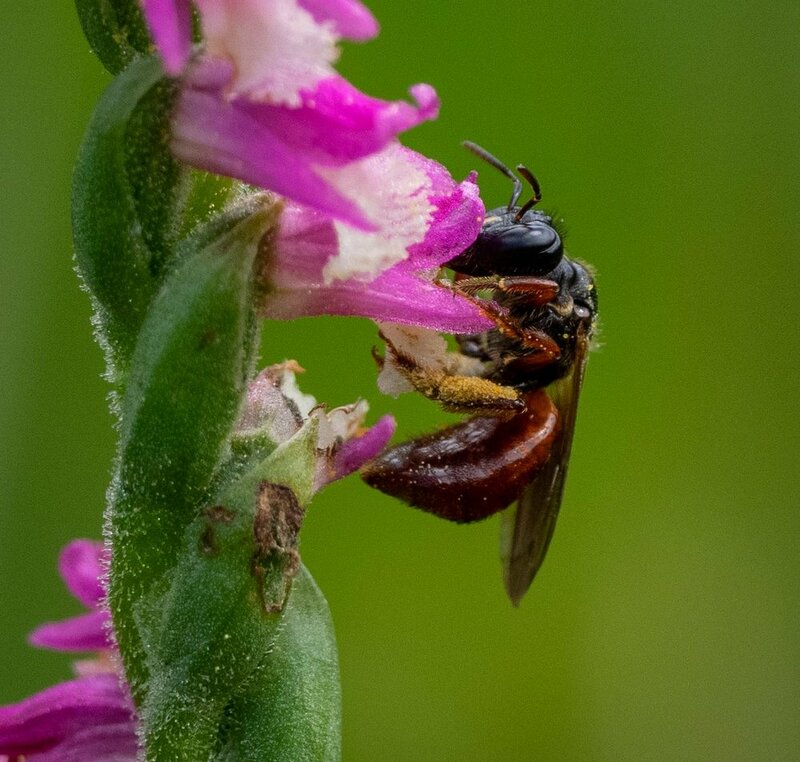 A camera, a careful eye, and patience is all that is needed to make a valuable contribution to the study of pollination biology and ecology. New sighting for the Atlas – to bee or not to bee! A related story – Life abounds in a Highland Swamp - was posted on our personal website Life in a Southern Forest . We are contributors to the Atlas of Life, and are very happy to share our sightings and discoveries with the Atlas community. Of course, all species photographed are also recorded as sightings on the NatureMapr database.